They offer players a putrid punch in the nose but likely little actual performance boost. So how exactly did smelling salts become an essential part of NFL game days? This story appears in ESPN The Magazine's Oct. 30 NBA Preview issue. Subscribe today! One whiff and Ezekiel Elliott's eyelids begin to flutter, his mouth falls oddly agape and his pupils roll back in his head. It's Week 4 of the NFL season, and kickoff is just moments away inside AT&T Stadium, where Elliott and a handful of his Cowboys teammates are breathlessly engaged in the latest, strangest sports ritual: huffing the stomach-turning noxious fumes found in smelling salts. Near the end of the first half, six members of the Dallas defense can be seen simultaneously hitting the salts before taking the field. The group includes veteran cornerback Orlando Scandrick, who jogs onto the field while using his right hand to make the sign of the cross and his left hand to sniff salts, and defensive end Demarcus Lawrence, the NFL's sack leader through four games. Lawrence says he can't drink coffee for a quick jolt during the game because it might affect his stomach, so he has turned to smelling salts. "The ammonia wakes you up, opens your eyes," Lawrence explains. "You'll be on the bench, you start to get a little tired and you got to wake your body up, and that's what that little ammonia does for you." But that simple explanation, like the entire smelling salts fad itself, doesn't quite pass the sniff test. ONCE PRESCRIBED to Victorian-era women plagued by fainting spells, ammonia inhalants are now manufactured in single-use capsules the size of a small stick of gum. Each sealed white plastic wrapper contains a .3-milliliter mix of alcohol (35 percent), ammonia (15 percent), water, oils and red dye that, when crushed between two fingers, stains the wrapper a telltale pink. Aerated by the alcohol, the ammonia fumes pack such a rancid punch -- imagine military-grade concentrations of Windex, wasabi and Vicks VapoRub that get T-shirt-cannoned up both nostrils -- that most users instinctively snap their heads back to escape the stench. The initial discomfort is quickly followed by a sensation that your breathing pathways have not just opened up but expanded exponentially while ramping up your alertness to an almost euphoric level. This phase is short-lived, however: Lawrence says that for him, it lasts about one set of downs. Also, the initial wave can sometimes be followed by prolonged bouts of nausea that serve as a vivid reminder of why household ammonia products come with the warning: Avoid inhalation of vapors. "The claim is that smelling salts arouse your consciousness and focus, but how many of us in our daily lives think it's appropriate during a tough day at work to open a bottle of ammonia and start sniffing the fumes?" says Dr. Joseph Estwanik, a fellow with the American College of Sports Medicine. "Ammonia's intended use is for cleaning. Giving a highly trained elite athlete ammonia to help them perform at their peak is like throwing a drowning man a cup of coffee." The company that manufactures the NFL's capsules, the New Jersey-based James Alexander Corp., has repeatedly stated that the product is designed to treat or prevent fainting. A company spokeswoman had no response when asked about the widespread misuse of smelling salts in the NFL. Ignoring the topic seems to be the common response when it comes to the league's secret little helper. Even though the capsules are typically distributed by athletic trainers, the National Athletic Trainers' Association wouldn't discuss the topic and doesn't have official guidelines on the use of ammonia capsules. There is one clear, though indirect, danger to using smelling salts: In the past, they've been routinely used to mask and combat concussion symptoms in sports such as boxing and football. In 2011, after quarterback Terry Bradshaw began experiencing the effects of brain damage suffered during his Hall of Fame career in Pittsburgh, he wrote: "When I played for the Steelers and I got my bell rung, I'd take smelling salts and go right back out there. All of us did that." For that reason, the practice of using salts has been banned for decades by major boxing organizations, and in the NFL, league spokesman Brian McCarthy says "team medical staffs do not use [smelling salts] in any way for the treatment of any concussion or other injury. "We have seen no proven performance enhancement and minimal risk," he says. "Team medical staffs monitor all aspects of their players' care." In college football, salts are already common. And Estwanik wants the NFL to outlaw ammonia before the league's huffing habit becomes just as widespread on the high school level, where there isn't enough medical supervision to prevent the use of ammonia to mask conditions such as asthma, dehydration and head injuries. 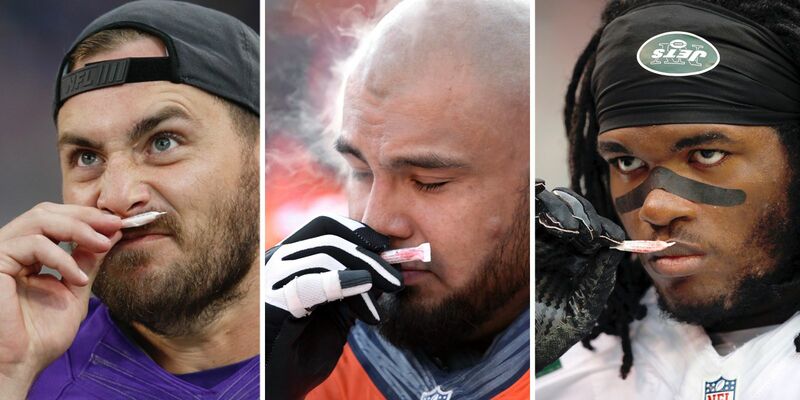 In the NFL, players sure don't seem concerned about the dangers, and they don't seem all that bothered by the fact that there's no scientific proof smelling salts actually work. Instead, they remain focused on anecdotal evidence that suggests the ammonia in smelling salts irritates the highly sensitive membranes in the nose and lungs, disrupting normal breathing patterns and inducing what's known as an "inhalation reflex," or the body's emergency survival instinct to restore stasis. The ammonia may also hyperstimulate the large trigeminal nerve that runs from the nostrils to deep inside the brain stem and thalamus. While doctors and trainers remain skeptical, athletes swear that this combination of responses to the gas triggers the nervous system's powerful fight-or-flight response, temporarily spiking levels of breathing, heart rate and alertness. Even if it's all the result of a placebo effect, NFL players just know it's legal and it works ... kinda. "It's such a painful smell, it's like a slap in the face," says Rams linebacker Connor Barwin, who was photographed making a Dr. Seuss-like face after sniffing salts during a 2013 game. "If you're going to go hit somebody, you better be ready, so this just wakes you up a bit, gets you locked and ready and alert." Because of that effect, perceived or not, former U.S. men's national soccer team star Landon Donovan popped a capsule before every match. Extra-strength smelling salts featuring brand names like Nose Tork and Wake Up Motherfxxxxr are targeted toward the powerlifting market. Ammonia capsules also remain popular in the NHL, except maybe in Boston, where in 2013, then-Bruins center Tyler Seguin accidentally tossed a discarded capsule into a fan's beer. In the NFL, where Brett Favre, Peyton Manning, Bengals coach Marvin Lewis and scores of others have been photographed while indulging, one former trainer estimated that more than 80 percent of players use smelling salts. (Former Giants star Michael Strahan once put that number in the 70 to 80 percent range too.) If they were used strictly as a treatment for fainting, a football team should go through maybe a handful of capsules the entire season. In just that one game against the Rams, the Cowboys left more than 100 broken capsules on their sideline. "The term I keep coming back to with the NFL and smelling salts is 'not for the intended use,'" Estwanik says. "And a similar term for that is just 'abuse.'" The optics aren't exactly ideal for an image-conscious corporation like the NFL. YouTube clips and social media threads of players sniffing salts typically inject snide references to drug use. In a Week 3 Monday night game against the Cardinals, cameras captured what looked like a scene straight out of an after-school special on inhalants when an oblivious Elliott huffed away while Dallas running backs coach Gary Brown yelled in his ear. Days later, network TV cameras in Green Bay captured a Gollum-eyed Clay Matthews enjoying several long, seemingly mind-altering pulls before taking the field against the Bears. These days, Tom Brady might be a well-known health food nut who won't poison his body with so much as a single tomato, but just a few years ago he could regularly be seen on the Patriots bench rewiring his thalamus with a cupful of ammonia capsules alongside his wide receivers. "We all do it," Brady told a Boston radio station when network cameras discovered his smelling salts habit. "It's kind of a receiver-and-quarterback thing." The NFL mentality has always been: If a little pregame caffeine is good, six Red Bulls is even better. If a little spray Stickum is good for the hands, then several cans can only be better. Therefore, if there's even a chance that one dose of ammonia improves breathing, alertness and performance, then 10 capsules a game can only be better. "Smelling salts are a pretty harmless way for players to clear their heads before battle," says a former NFL trainer with more than 30 years' experience. "They're also a classic, comical example of how NFL players think. If one guy does it and he has even some small bit of success with his new routine or superstition, the next week everyone will be doing it." So does it matter if all the benefits are in players' heads? "It might provide a psychological advantage, whether it actually helps or not," says Dr. Robert Cantu, a former president of the American College of Sports Medicine and a senior adviser to the NFL Head, Neck and Spine Committee. "If Elliott thinks smelling salts work, then in his mind, he's going to gain more yardage if he uses them." Not always. Back in Dallas, Elliott has 139 all-purpose yards and two touchdowns, but he's overshadowed by Rams running back Todd Gurley, who gains 215 all-purpose yards and puts Los Angeles ahead for good in the third quarter with a 53-yard touchdown reception. The Cowboys have a chance to win on their final possession, but with 36 seconds left to play, the drive stalls on fourth-and-10. Elliott is stopped at the 39. Yep, just a whiff shy of the first down.